The prevailing hypothesis concerning the evolution of the anthropoid visual system is that ancestral haplorhines were nocturnal. Later their descendants invaded a diurnal niche, with the evolution of highly acute, three-color vision. Now, a new study (Melin et al. 2013) challenges this view, suggesting instead that stem haplorhines already possessed three-color vision before they move into a fully diurnal niche. In order to better understand how primate vision evolved, Amanda Melin and her colleagues examined tarsier eyes. Tarsiers are tiny nocturnal primates (Figure 1) that branched off from anthropoid primates (monkeys, apes and humans) early on (approximately 56 million years ago). 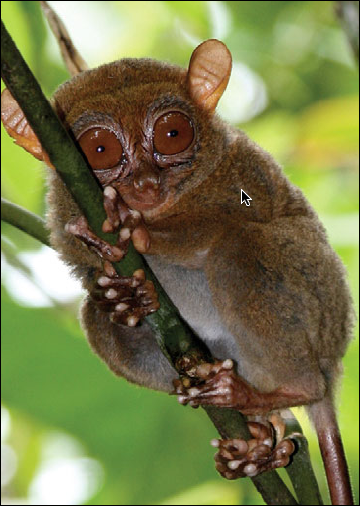 When tarsier genes that encode opsins, a class of color photopigments used in color vision, were analyzed, the results suggested that the last common ancestor of crown tarsiers possessed high-acuity trichromatic color vision (Figure 2). This three-color vision is the same type found in living monkeys and apes. Although this type of vision would normally denote a daytime lifestyle, fossil tarsiers had large eyes, suggesting they were nocturnal. Why would ancestral tarsiers have trichromatic vision if they were completely nocturnal? One possibility is that early tarsiers were originally adapted to dim light, such as occurs at twilight or on moonlit nights. Dim lighting would be dark enough to favor large eyes, but bright enough to support three-cone color vision. This suggests that the three-color vision developed before primates became diurnal. Over time tarsiers shifted to a nocturnal niche while anthropoid primates evolved to take advantage of the daytime. The findings give researchers a better understanding of how vision evolved in the earliest of our ancestors.